The IBM ServeRAID M1015 is a LSI SAS 2008 based card. LSI SAS 2008 based cards can be flashed to many different firmware revisions as Pieter goes in depth on this particular card. The LSI SAS 2008 can be found in servers for almost every OEM so there is very wide driver support. These are highly recommended in ZFS setups using OpenIndiana, Solaris, FreeBSD (such as FreeNAS) and Nexenta. 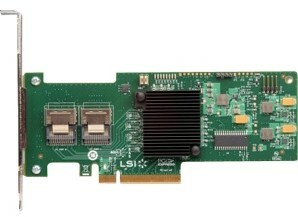 The LSI SAS 2008 has eight ports and is a 6.0gbps SAS card. Recently, the IBM ServeRAID M1015 cards have been selling for $100 or more, making the cache and BBU IBM ServeRAID M5014’s very attractive at $130 in many applications such as Windows Server 2012. At $65 plus $10 shipping the IBM ServeRAID M1015 is a fairly solid deal. The eight ports use SFF-8087 ports, so depending on your drive configuration you will likely want either SFF-8087 to SFF-8087 or SFF-8087 breakout cables. For those that also will want bracket for the IBM ServeRAID M1015, a forum member BigXor sells brackets at reasonable prices. This deal was spotted by one of the forum members McKajVah from Norway, so a big thank you for bringing this up. Nice find. Good to see a site that finds deals like this. I am stumped on an issue with a cross flashed M1015 (to LSI9211-8i in IT mode) perhaps you could look at this link and provide some advice to me.